Why Obama gets so much love on the Internet. With President Obama’s approval rating at an all-time low, you might think this week represents the nadir of his White House tenure. Maybe not! The Internet still loves him, or at least the part of the Internet population that produces memes. Obama is the first president to hold office during the full flowering of meme culture, and the anonymous Web wags who make animated GIFs and image macros have been surprisingly kind to him. Why does Obama have such natural Internet appeal? This aspect of Obama’s online profile became even more prominent with the Osama Bin Laden raid—a mission that appealed to the Internet both for its success and the way it seemed ported straight out of a video game. It’s tempting to take a further leap and assume that Obama’s Internet appeal translates into re-electability, that it’s some kind of below-the-radar indicator of his popularity. The meme auteur Jonah Peretti set me straight: “Republicans lack the creativity and sense of humor required to make a funny meme,” he wrote me. “And the pot-smoking, lefty hipsters who make the best memes tend to think Obama is a pretty cool dude.” So there it is: Obama gets a free pass on the Internet because the people who make memes are his kind of people. The 2012 election may be when meme culture becomes more than just something you chuckle at on Buzzfeed. The recent crazy-eyed Michele Bachmann Newsweek cover shows how the meme spirit can influence the mainstream. Tina Brown chose to run the unflattering photo that’s usually left on the cutting room floor. And the gambit worked: The exploitable, odd photo got our attention. The meme spirit will give political consultants fits because it’s so unpredictable—Obama picking up a snowball becomes Obama bullying an adorable cat. Though you can also see the other side: A candidate who cleverly plays to the meme makers enhances his or her image. 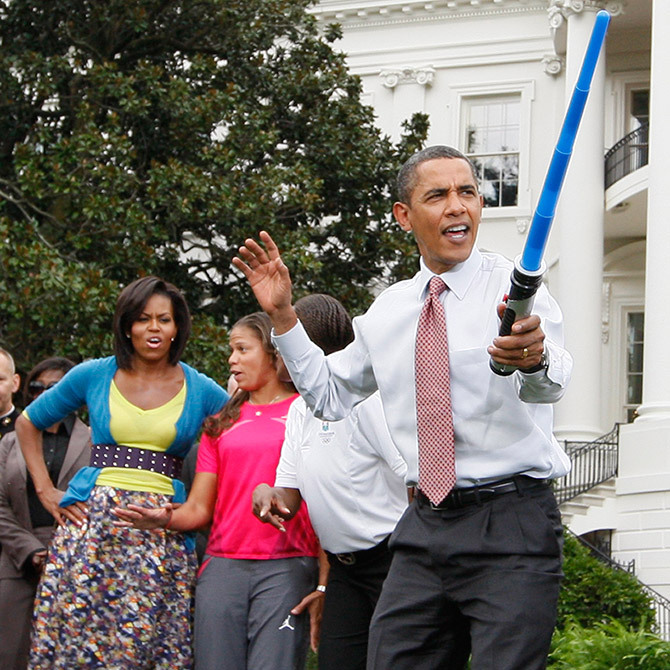 Obama had to know what was going to happen when he picked up a lightsaber outside the White House—a thousand Jedi posters bloomed. But memes have traditionally proven difficult to engineer. The best strategy is to surf the wave as it’s forming, as Obama’s campaign did with the Shepard Fairey “ Hope” poster.